This is a Japanese Professional Kitchen Knife, made by SAKAI AJIMASA, one of famous workshop for Traditional Japanese Knife , one of the most famous workshop for Traditional Japanese Knives of professional use. Currently the 3rd master, Tsukasa Ajioka, the son of 2nd master, has taken over all SAKAI AJIMASA Brand, maintaining for 100 years in SAKAI, Osaka prefecture. This series is well-known among Japanese Chefs of Sushi-dining and Traditional Japanese Cuisine, as AJIMASA has sought every possibilities with best technology of traditional blade polishing to realize easy-to-use, Cheffs friendly Knives for years. They are actually having a great reputation among famous Japanese Sushi-Dining of some Michelin Guide winners!!! 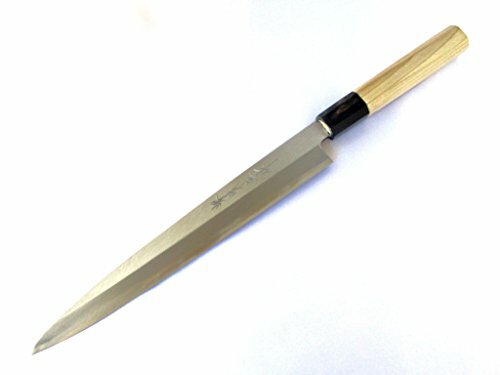 His Knives have been very famous for cutting ability by superior Yasuki Shirogami(White steel) of Hitachi Metals, but they are also well taken care of detailed part, such as Chamfering from heel to Machi, where wet finger touches, is one of the best work of the item. We are pleased to offer you a series of high class professional Japanese Knives with reasonable pricing from Sakai/Japan. 4 Size Variation :Blade Length from 210mm/8.3" to 300mm/11.8"
If you have any questions about this product by SAKAI TAKUMI AJIMASA, contact us by completing and submitting the form below. If you are looking for a specif part number, please include it with your message.